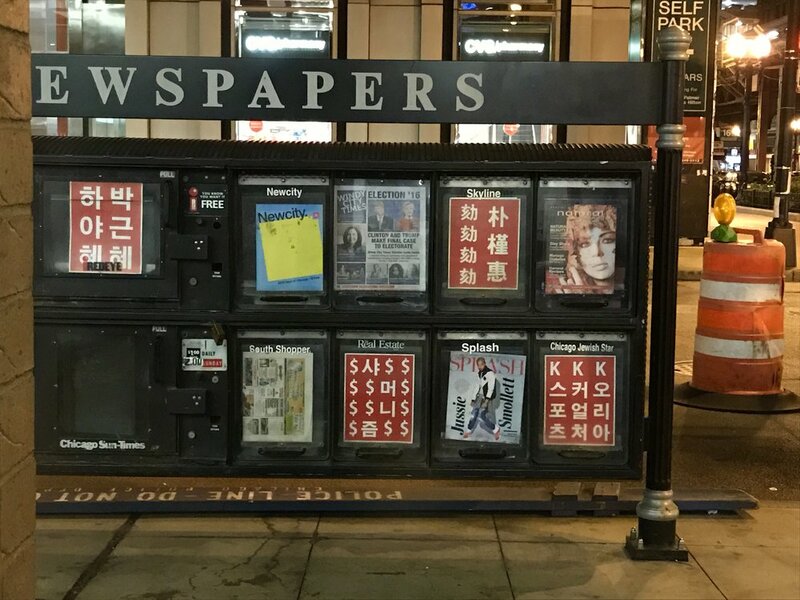 OUST Project (2016-2017) educates the School of the Art Institute of Chicago and Chicago population at large about the 2016-17 presidential political scandal in South Korea through Lim's performance as a standing banner/newsstand. OUST Project was conducted before and after the end of Park Geun-hye's presidency. Park Geun-hye and Choi Soon-sil Gate involves the influence of Choi Soon-sil, the daughter of a shaman-esque cult leader Choi Tae-min, over President Park Geun-hye. Widespread coverage of this South Korean political scandal began in late October 2016. On December 9th, Park was impeached, and Prime Minister Hwang Kyo-ahn became the acting president. On December 21st, a Special Prosecution Team led by Park Young-soo began to investigate the Park-Choi Gate scandal. On March 10th, 2017, The Constitutional Court of Korea ruled to uphold the impeachment of President Park Geun-Hye. All 8 judges agreed that Park abused her power as a president. The Oust Project performance in front of SAIC’s Sharp building, February 2017. Photograph by Jinchen Cai. My name is Jae Hwan Lim, and I am an artist-activist from South Korea, studying at the School of the Art Institute of Chicago (SAIC). You may already know that it has been approximately two months since President Park Geun-hye was impeached and jailed. Since the eruption of the Park-Choi Soon-sil corruption scandal in late October 2016, Park’s unscrupulous dealings and her dishonest political decision-making stunned people internationally. Western news media, such as New York Times, Wall Street Journal, Bloomberg, and CNN reported the scandal as mainstream breaking news following the impeachment of President Park. As a South Korean citizen living abroad, I was repeatedly asked by people to explain the crisis in South Korea. Although I am used to sharing my art, which is about bureaucracy, police brutality, and media censorship in Korea, it is still painful for me to describe the downfall of a national leader and the chaos in my country. I feel like I am one of the few students at SAIC who actively speaks out about Korean politics. At SAIC, 30 percent of the student population is international students; you, Korean students, compose the second most common nationality. Despite the large number of Korean students on-campus, our Korean and Korean-American students are not vocal about politics in general. When South Korean culture is celebrated on campus, it is in neutral and apolitical ways. SAIC’s Korean Student Association (KSA) offered free Korean food and performed K-pop for the Korean Thanksgiving Day and New Year’s event. When the Park-Choi Scandal occurred in 2016 and the issue continued in 2017, millions of Koreans in South Korea gathered for a number of mass candlelight vigils and spoke out against the government. KSA did nothing in response to the scandal. This lack of political response is not just limited to the students. The Consulate General of the Republic of Korea in Chicago and the Korean Cultural Center of Chicago hosted an event called “Inspired Korea in Chicago” at the Harris Theater, which presented Korean traditional music and dance in December 2016. As the Park regime was accused of creating artist blacklists in Korea and even in New York, I protested in front of the Harris Theater by holding a foam board banner on the day of the event. The phrase was “Oust President Park Geun-hye”; I wrote the Korean translation — “박근혜 퇴진” — on the other side of the board. A few Koreans, including The Korea Times Chicago newspaper reporter Da-eun Hong, and some non-Korean individuals asked me to describe the sociopolitical situation in Korea, and cheered me on by saying encouraging words and giving me hand-warmers. But I was scolded by old Korean ladies, and I even heard them swearing, with fingers pointed at me. The Korean student advisor and students from SAIC saw me and ignored me. They looked like they were ashamed of me. The Oust Project performance in front of Harris Theater, at the “Inspired Korea in Chicago" (event organized by the Consulate General of the Republic of Korea and Korean Cultural Center of Chicago) in December, 2016. Photograph by Da-eun Hong. Korean students at the University of Chicago and Northwestern University, and other Koreans in Chicago made joint statements criticizing President Park’s corruption and gathered for rallies. The Koreans at SAIC were quiet. I am trying to understand why. Is not democracy and freedom of expression the reason you came to study art in the United States? Are you so privileged that politics do not affect your life? Are you too busy to be outspoken about politics? Are you so ashamed of Korea’s political chaos that you cannot at least gather to talk about your nation’s situation? Is it hard to ask the Korean advisor and school to be more supportive for you to talk about Korea through events beyond Thanksgiving and New Year’s event? I wonder how the busy and privileged students at the University of Chicago and Northwestern University managed to find time to come out to voice their opinions through statements and to record their statements in videos. Korean students from the University of Chicago and Northwestern University and colleges throughout the world were not forced by any authorities to criticize South Korea’s undemocratic environment. They chose to use their freedom of expression to protest the censorship in Korea. What did you choose to do? Several Korean SAIC students I talked to said the reason KSA and Korean students individually were not vocal about the situation was because demonstration is not a form of art. Then have you or KSA been creating politically-driven artworks that inform people about Park-Choi scandal, or any type of Korean history? I cannot compel anyone to act in certain ways nor can I control people’s thoughts. I can only make myself available: If any Korean students are active in thinking socio-politically, we can work together on collaborative projects to educate non-Koreans about our country. In response to the Park-Choi scandal, I continued my “Oust President Park Geun-hye” banner performance in front of SAIC school buildings. My performance was inspired by the same candlelight vigils that were held every Saturday to impeach President Park. Most of you at SAIC smoked cigarettes behind me or took pictures as if I would not notice. I ignored your indifference and focused on educating the non-Korean population in Chicago. I tend not to think that art can change society. However, the gatherings of citizens who shared their voices led all eight judges in the Constitutional Court of Korea to agree to impeach Park. The Oust Project performance in front of SAIC’s Sharp building, March 2017. Photograph by Sumin Im. Korea’s democratization movement continued in Gwangju from May 18 to 27, 1980. It was an uprising against the Chun Doo-hwan regime, and 606 people were killed by government troops. With the people’s sacrifice, Chun and Roh Tae-woo, the president after Chun, received death sentences, and were charged with mutiny, treason, and corruption. While there were people active in changing their society, you were quiet and acquiescent about the same situation. When people were sacrificing their daily lives by participating in protests to ensure a better future, you were doing little or nothing. Your collective apathy and passive attitude discourages people working together for democracy. Political and social rights and equality are basic human rights in South Korea, and voting is the most significant method to voice your opinion. After President Park Geun-hye’s impeachment and arrest, South Korea will conduct a new presidential election on May 9, 2017. Korean citizens living abroad should have registered to vote by March 30 and the voting took place between April 26 and 30. Many Koreans whom I know, even some I consider to be vocal about politics, did not register to vote or missed the date to register. President Park was elected due to the Korean public’s unconditional faith in her pledges. We cannot let this happen again. We need to show our power as citizens by voting, and to educate ourselves constantly about politics and history to continue Korea’s proud democracy. The Oust Project performance in front of SAIC’s Sharp building, March 2017. Photograph by Louisa Zheng. 저는 시카고 예술대학교 (SAIC) 재학 중인 대한민국 국민, 활동가-예술가 임재환 입니다. 독자도 미리 알고 있듯이 박근혜 전 대통령이 탄핵되고 구속된지 두달 정도 되었습니다. 2016년 10월 박근혜-최순실 스캔들이 일어난 후 박 전 대통령의 무책임한 정치행위와 부정부패가 사람들을 세계적으로 놀래켰습니다. 뉴욕 타임즈, 월 스트릿 저널, 블룸버그, 그리고 CNN과 같은 서구 뉴스 미디어들이 이 스캔들과 박 전 대통령의 탄핵을 속보로 발표했습니다. 수 많은 외국인들은 해외에서 거주하는 한국민인 제게 한국의 이 고비에 대해 물어보았습니다. 제 작품이 한국의 관료주의, 경찰 폭력, 미디어 검열에 대해 이야기함에도 불구하고 한 국가 리더의 몰락과 제 나라의 혼란을 설명하는게 고통스러웠다는 점은 무시할 수 없습니다. 저는 이 상황들을 통해 제가 SAIC에서 한국 정치에 대해 활발히 이야기하는 몇 안되는 사람들 중 하나인 것을 알았습니다. SAIC에는 30%정도가 외국인 학생입니다 그리고 한인 학생들인 여러분들은 그 중 두번째를 차지합니다. 교내 많은 학생 비율이 한인임에도 불구하고 한인과 한국계 미국인 학생들은 정치에 대해 전반적으로 목소리를 높이지 않습니다. 여러분들은 교내에서 한국의 문화를 기념할때 중립적이고 비정치적인 방법을 택합니다. SAIC의 한인 학생회 (KSA)는 추석과 새해 이벤트를 통해 무료 한국음식을 나눠주고 K-pop 춤을 선보였습니다. 2016년 박근혜-최순실 스캔들이 일어났을 때와 2017년 박근혜 대통령이 탄핵 되었을 때까지 한국에서는 10만명의 대한민국 국민들이 대규모 촛불 시위를 위해 모였고 자신의 의견을 나눴습니다. KSA는 이 스캔들에 대한 반응이 없었지요. 정치에 대한 무관심적 반응은 학생들에 국한되지 않습니다. 2016년 12월 주 시카고 대한민국 총영사관과 시카고 한국 문화 회관은 Harris 극장에서 Inspired Korea in Chicago라는 이벤트를 공동 주최해 한국 전통 음악과 춤을 선보였습니다. 박근혜 정권이 한국 내, 심지어 뉴욕에서 활동하는 예술가 블랙리스트를 만든 것으로 기소되었기 때문에 저는 홀로 행사 당일 Harris 극장 앞에서 플래카드를 들고 시위했습니다. 관용구는 “Oust President Park Geun-hye” 그리고 한글로 해석해 판자 반대편에는 “박근혜 퇴진”이라고 적었습니다. 시카고 한국일보 홍다은 기자를 포함한 몇몇 한인 분들과 외국인 관객들은 제게 한국의 사회정치적 상황을 설명해줄 수 있겠냐며 질문했고 격려의 말씀과 손난로를 건네주시며 저를 응원해 주셨습니다. 하지만 한국인 아주머니들과 할머니들은 제게 손가락 질과 욕설을 하시며 꾸짖으셨습니다. SAIC의 한인 학생 담당자와 학인 학생들은 저를 보고 무시하더군요. 저를 부끄러워하는 것처럼 보였습니다. 시카고 대학교와 노스웨스턴 대학교의 한인 학생들과 시카고 거주 재외국민들은 박 전 대통령의 부정부패를 비판하는 시국선언을 했고 집회를 위해 모였습니다. SAIC의 한인학생 여러분들은 조용했습니다. 여러분은 민주주의와 표현의 자유를 이유로 미국에서 예술을 공부하는 것이 아닙니까? 본인이 특권을 가졌기 때문에 정치가 삶에 영향을 끼치지 않는다고 생각하십니까? 너무 바빠 정치에 대해 이야기할 시간이 없으십니까? 한국의 정치적 혼돈이 부끄러워 최소한 같이 모여 본인 나라의 시국을 이야기 할 수도 없는 겁니까? 추석과 새해 이벤트 외에 한국의 다른 점을 보여주는 이벤트를 만드는데 도움을 달라고 한인학생 담당자와 학교에 요청 하기 힘이 듭니까? 시카고 대학교와 노스웨스턴 대학교의 바쁘고 특권을 가진 학생들이 어찌 시간을 내어 시국선언을 하고 그를 통해 본인의 의견을 표출하고 비디오로 녹화할 수 있었는지 궁금합니다. 시카고 대학교와 노스웨스턴 대학교 뿐 아니라 전 세계 대학교의 한인 학생들은 어떠한 권위자가 강요했기 때문에 대한민국의 비민주적인 환경을 비판한 것이 아닙니다. 그들은 본인의 표현의 자유를 한국의 검열에 반대하는 시위에 사용하도록 결정했습니다. 여러분은 무엇을 하도록 결정했나요? 제가 대화나눈 SAIC의 몇몇 한인 학생들은 KSA와 한인 학생들 개개인이 시국에 대해 이야기 하지 않은 이유가 시위가 예술의 형태가 아니여서 라고 했습니다. 그럼 본인이나 KSA는 박근혜-최순실 스캔들이나 한국의 역사를 알리는 작품을 만들었습니까? 저는 특정 사람을 어느 방식으로 행동하거나 생각하도록 강요할 수 없습니다. 만약 한인 학생들이 사회 정치적으로 활발히 생각한다면 저희는 한인이 아닌 사람들에게 한국을 알리는 공동 프로젝트를 할 수 있을 것 입니다. 박근혜-최순실 스캔들에 대해 저는 “박근혜 퇴진” 플래카드 퍼포먼스를 SAIC 건물앞에서 계속 진행했습니다. 제 퍼포먼스는 매주 토요일마다 박 전 대통령을 탄핵하기 위해 촛불 시위를 한 국민들로부터 영향을 받았습니다. 많은 SAIC의 여러분들은 제 뒤에서 담배를 피던가 제가 모를 것 처럼 사진을 찍었습니다. 저는 여러분의 무관심을 무시하고 시카고의 외국인들을 교육시키는데 집중했습니다. 저는 예술이 사회를 바꿀수 있다고는 생각치 않습니다. 다만 본인의 목소리를 높인 시민들의 모임으로 대한민국 헌법 재판소의 모든 8명 재판관들이 박 전 대통령을 탄핵하도록 이끌었습니다. 한국의 민주화 운동은 1980년 5월 18일에서 27일까지 광주에서도 이어졌습니다. 이는 전두환 정권에 반대한 운동이었으며 606명의 사람들이 정부군에 죽음을 당했습니다. 시민들의 희생으로 전 전 대통령과 그 뒤를 이은 노태우 전 대통령은 폭동, 반역죄, 부정부패로 사형을 선고 받았습니다. 이 세상에는 본인이 속한 사회를 바꾸기 위해 활발히 노력하는 사람들이 있는 반면 같은 상황에 대해 조용하고 묵인하는 여러분이 있습니다. 이 세상에는 본인이 더 나은 미래에서 살 수 있도록 일상 생활을 희생하고 시위에 참가하는 사람들이 있는 반면 아무일도 안하거나 조금만 하는 여러분이 있습니다. 여러분의 무관심과 수동적 태도가 민주주의를 지키기 위해 노력하는 사람들을 좌절시킵니다. 참정권과 사회권, 평등권 등은 대한민국민의 기본 권리이며 투표는 본인의 의견을 표출하는데 가장 중요한 방법입니다. 박근혜 전 대통령이 탄핵되고 구속 된 후 2017년 5월 9일 한국은 대통령 선거를 진행합니다. 재외국민들은 투표를 위해 3월 30일까지 등록해야 했고 4월 26일에서 30일까지 투표가 진행되었습니다. 몇몇 정치에 관심있다고 생각한 제 주변의 한국인들 조차 투표 등록을 하지 않거나 투표 등록 시간을 놓쳤다고 합니다. 18대 대통령의 당선은 국민들이 박근혜 전 대통령의 공약을 무조건적으로 신뢰한 결과입니다. 우리는 이 일이 다시 일어나도록 할 수 없습니다. 우리는 시민으로서의 힘을 투표를 통해 보여주어야 하며 우리 자신을 지속적으로 정치와 역사를 교육시키며 한국의 자랑스러운 민주주의를 지켜 나가야 할 것 입니다. The Oust Project at a newsstand across Chicago Cultural Center, November 2016. The Oust Project at a newsstand across SAIC’s Sharp building, November 2016. The Oust Project at Aram Han Sifuentes’s Protest Banner Lending Library in Chicago Cultural Center, March 2017.